This handbook, produced in 2008, is intended to be a very comprehensive guide to all Koi enthusiasts worldwide if they are considering visiting this area. It is also written to give vital information on every page to those who have already made their first visit/s and may be still confused in some areas. For others, who do not intend to visit, it gives vital details of many famous and not-so-famous Nishikigoi breeders throughout this area which is the undisputed birthplace of Nishikigoi. • Best times of the year to visit Yamakoshi. • Travel instructions from Tokyo’s Narita airport to either Nagaoka or Ojiya Cities. • Your bearings in relationship to Yamakoshi from either city. • Hotels, Car Hire, Restaurants and bars – full contact details for either city. • How to speak in Japanese with the breeders easily. • How to understand Japanese monetary terms easily. 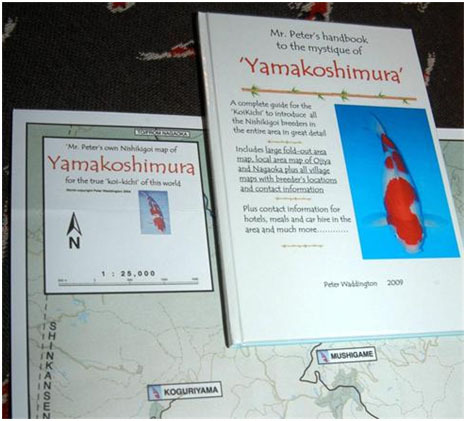 • Yamakoshi village maps detailing every breeder and contact details for each breeder. • Landmark pictures of ‘difficult-to-find’ locations plus breeder’s faces. • How to arrange shipping of Koi and full details of clearance on arrival back home to the buyers airport. Very little of the information in this handbook has ever been available before and it is the first book of its kind to be published in the English language. *For those outside of the UK wishing to purchase please email infilkoi@googlemail.com for delivery costs.